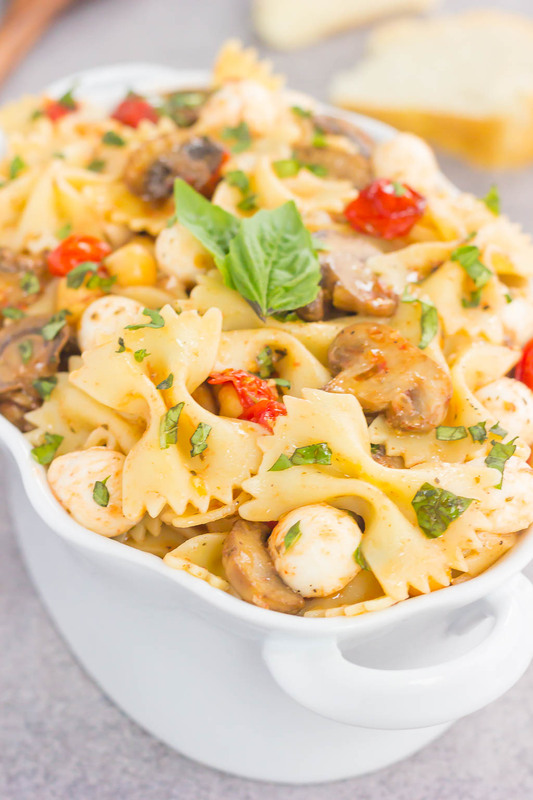 This Roasted Mushroom and Tomato Pasta Salad is a flavorful dish that comes together in minutes. 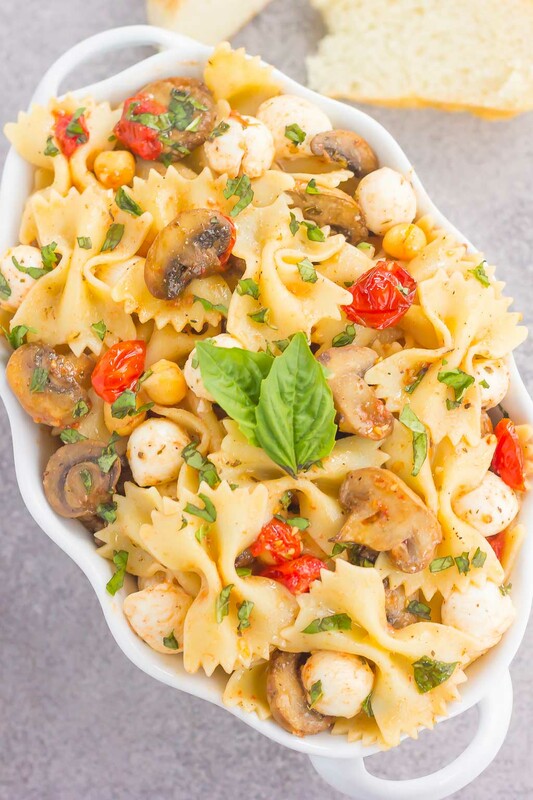 Fresh mushrooms and cherry tomatoes are roasted until tender and then tossed with chickpeas, mozzarella and pasta in a light, white balsamic dressing. Bursting with flavor and perfect for a light lunch or dinner, you’ll be making this pasta salad all year long! I’m pretending it’s summer and breaking out the pasta salad today, friends! Actually, any time is ok for pasta salads, am I right? I hope you said yes, because I’ve been in a salad-loving mood lately. Oh, who am I kidding…I’m always in the mood for salads, just like I am with soups, too. I was browsing through a magazine a few weeks ago and was inspired to make this pasta salad. One, because it had mushrooms (I’m obsessed with them, remember?) and two, because pasta. And there’s really no excuse to consume all the pasta. So, of course, I decided to put my own spin on the pasta salad, which ended up being something entirely different. But that’s a good thing! Because pasta salad makes me happy, and I’m hoping that it makes you happy, too. There are several things that I love abut the pasta salad. First, the mushrooms. Oh, the mushrooms! I used a pound of mushrooms and roasted them until tender, along with some halved cherry tomatoes. Both are drizzled with olive oil and seasoned with garlic powder, dried oregano, salt and pepper. This combination gives the mushrooms and tomato the perfect amount of flavor. And then comes that white balsamic dressing. You must know by now that I practically use white balsamic vinegar and a mixture of olive oil for most of my salad dressings (see here, here, and here). It’s lighter and slightly sweeter than regular balsamic vinegar, which is perfect for this Roasted Mushroom and Tomato Pasta Salad. And last, but certainly not least, the chickpeas, mozzarella pearls and fresh basil add the finishing touch to this flavorful salad. Mozzarella and basil pair so well together, and the chickpeas add the perfect touch of texture. 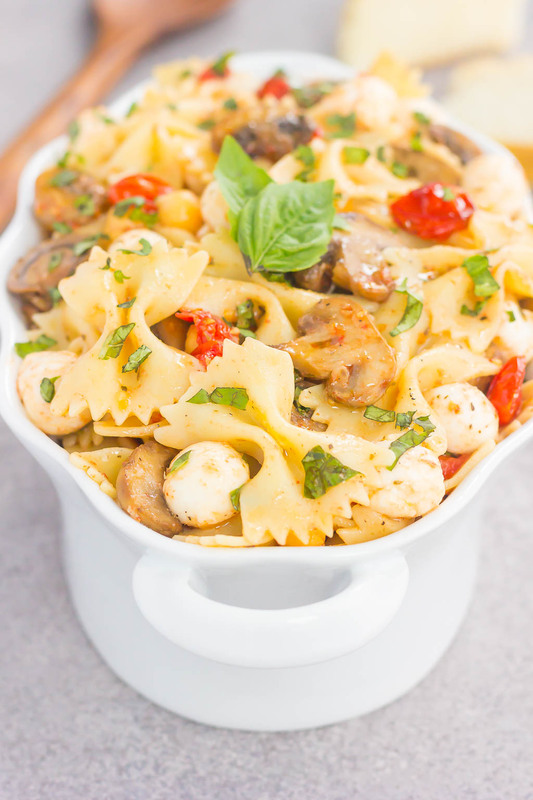 This Roasted Mushroom and Tomato Pasta Salad is so easy to customize depending on your tastes. Don’t like chickpeas? Swap in kidney beans instead or leave them out! Like a protein with your salad? Add in some grilled chicken! Mozzarella not your thing? Swap in some cheddar or goat cheese instead! See what I mean? So channel those winter blues into summer and whip up this oh-so deliciously easy pasta salad. 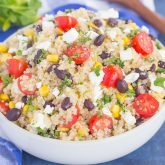 With simple ingredients, hardly any prep time and full of flavorful, I guarantee it’ll be love at first bite! This Roasted Mushroom and Tomato Pasta Salad is a flavorful dish that comes together in minutes. Fresh mushrooms and cherry tomatoes are roasted until tender and then tossed with chickpeas, mozzarella and pasta in a light, white balsamic dressing. 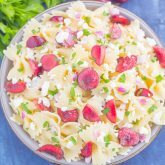 Bursting with flavor and perfect for a light lunch or dinner, you'll be making this pasta salad all year long! Preheat oven to 450F. Line a large baking pan (you may need two pans) with parchment paper or grease well with non-stick cooking spray. Spread mushrooms and tomatoes, cut side up, evenly onto prepared pan(s). Sprinkle with garlic powder, dried oregano, salt and pepper. Then drizzle with olive oil. Roast for 22-25 minutes, or until mushrooms are golden brown and tomatoes begin to split. While mushrooms and tomatoes are roasting, cook pasta according to package directions until al dente. Drain and immediately rinse under cold water. Place cooled pasta into a large bowl. Add olive oil, white balsamic vinegar, and garlic powder. Toss to coat. Add mushrooms, tomatoes, chickpeas, mozzarella pearls, and basil. Season with salt and pepper, if needed. Gently toss to coat. Thanks, Sarah! 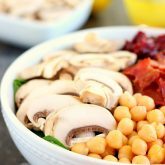 Mushrooms make this salad extra special! Love mushrooms. 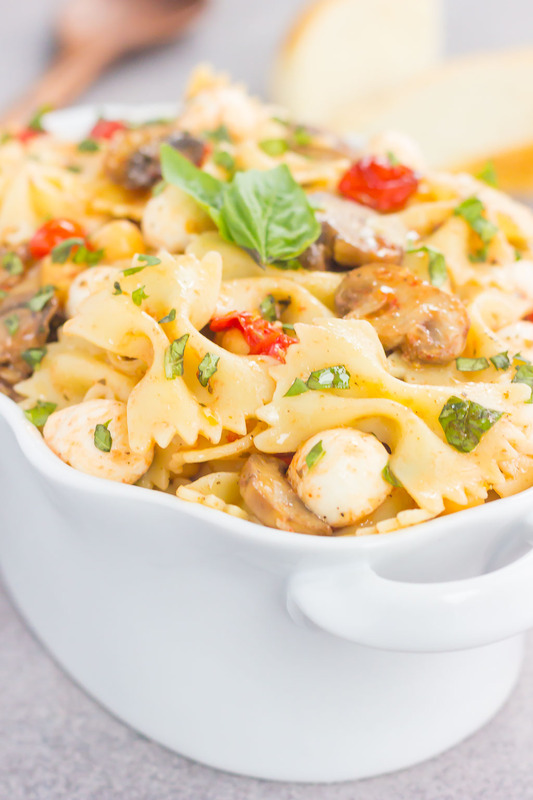 This pasta salad looks perfect! Just got some mozzarella balls and will definitely try it! Pinning! Thanks, Mira! Hope you love this if you try it! 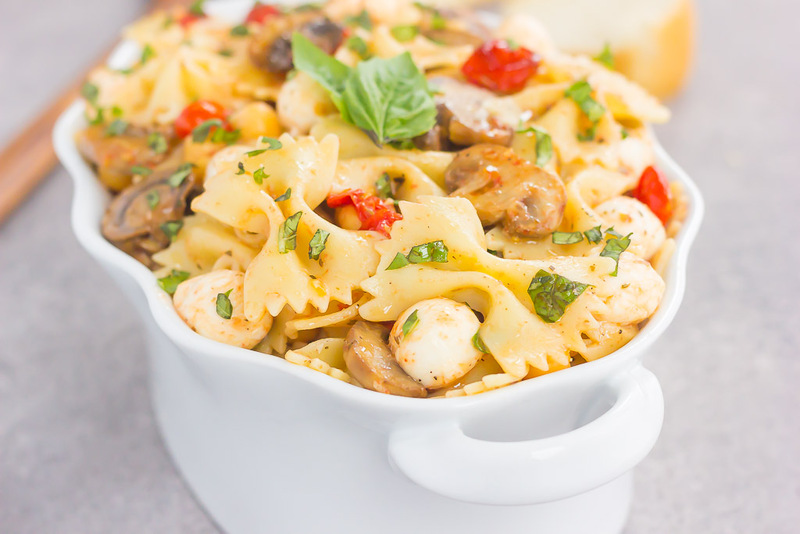 I'm a huge fan of mushrooms and add them everywhere I can, so I'm loving this pasta salad! Roasting the mushrooms gives them so much flavor yet I don't do that enough. This looks so good and would make a great lunch during the week! Thanks, Marcie! I love roasting mushrooms when I can...adds so much flavor and is so easy! 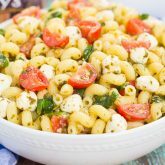 This is my type of pasta salad, it looks so beautiful, and the addition of chickpeas and mozzarella just sounds amazing! Thanks for the kind word and for stopping by, Albert! This is such a delicious looking salad, would be perfect for lunch too! Thanks for the sweet comment and for stopping by, April! This would definitely work for any kind of meal. I could totally go for a pasta salad right now! Swooning over those roasted mushrooms...we share that love! Yay for roasted mushrooms! Thanks, friend!